"The Flight" redirects here. For the 1970 Soviet film, see The Flight (film). For the 1988 American TV movie, see The Taking of Flight 847: The Uli Derickson Story. Alpha Flight is a fictional team of Canadian superheroes appearing in American comic books published by Marvel Comics. The characters premiered in The Uncanny X-Men #120 (April 1979). Marvel published an Alpha Flight comic book series from 1983 to 1994. Created by writer and artist John Byrne, the team first appeared in The Uncanny X-Men #120 (April 1979). Most team members have distinctly Canadian attributes, such as having Inuit or First Nations heritage. Throughout most of its history, the team has worked for Department H, a fictional branch of Canada's Department of National Defence that deals with super-powered villains. The team was originally merely a part of the backstory of the X-Men's Wolverine but, in 1983, Marvel launched an eponymous series featuring the group, which continued until 1994, lasting 130 issues as well as annuals and miniseries. Three short-lived revivals have been attempted since, most recently an eight-issue limited series in 2011–12, after the resurrection of the team in the one shot comic Chaos War: Alpha Flight during the Chaos War event. Alpha Flight was preceded by a team called "The Flight". This team first appeared in Alpha Flight Special vol. 2, #1 (1992). Inspired by the debut of the Fantastic Four, James MacDonald Hudson refined the purpose of Department H to find and/or develop Canada's superheroes. New recruit Groundhog joins Snowbird, St. Elmo, Stitch, Wolverine (as Weapon X), and Smart Alec in training. Within a week, the Flight is pressed into their first battle with Egghead's Emissaries of Evil. Egghead threatens the United States from Canadian soil with a nuclear missile. Smart Alec disables the missile's guidance system, but Egghead triggers the detonation sequence. Smart Alec panics leading to St. Elmo transforming the missile and the bomb into light. St. Elmo succeeds, but loses himself in the process. Groundhog and Dr. Michael Twoyoungmen scold Hudson for sending the team into battle while so inexperienced, with a near psychotic leader (Weapon X) and someone who folds under pressure. Hudson thus makes plans for a tiered team system, leading to the formation of Alpha, Beta and Gamma Flight. Alpha Flight first appeared in X-Men #120 (April 1979), in which they are sent to follow up on Vindicator's first mission to retrieve Wolverine from the X-Men. Guardian: Originally Weapon Alpha, then Vindicator, James MacDonald Hudson is a scientist from London, Ontario who wears a suit of battle-armor, allowing him to fly and manipulate Earth's magnetic field. Guardian is sometimes the team leader, and wears a stylized maple leaf flag on his costume. Northstar: Jean-Paul Beaubier, from Montreal, is a mutant with powers of super-speed and light generation. Aurora: Jeanne-Marie Beaubier is Northstar's twin sister who suffers from dissociative identity disorder (multiple personalities). Like her brother, she is also a mutant with powers of super-speed, flight, light generation, and molecular acceleration. Snowbird: Also known as Narya, she is an Inuit demi-goddess from Yellowknife, who can transform into animals of the north. According to Byrne, both Guardian and Snowbird were "fan characters", created before he became professionally involved in comics, and he created all the remaining members while working on X-Men #120, specifically designing them to be balanced with the X-Men in power. The first Alpha Flight comic book series started in 1983 which ran until 1994. Heather MacNeil is the wife of James Hudson. After Guardian's apparent death in Alpha Flight #12, she becomes the leader of the team. Later, she takes a replication of his costume and takes the codename of Vindicator then Guardian. Alpha Flight continued for 130 issues, and introduced dozens of characters and villains (the most prominent of which were Talisman, Madison Jeffries, Box, Diamond Lil, Wild Child, Persuasion, and Witchfire). Radius: Jared Corbo is a mutant with the ability to create a force field. General Clarke: The sinister new director of Department H, responsible for many of the dark plots surrounding the team. Gains some measure of redemption with his sacrifice in issue #12. The focus of this series was on Department H's consistently hidden agenda and Alpha Flight's reluctance to comply thereto. The conspiracy plotline saw Weapon X allowing an incarnation of the Zodiac Cartel to kidnap Madison Jeffries, who was subsequently brainwashed into becoming the group's "Gemini". To keep the group from interfering with their "deal", Department H brainwashed the team into forgetting Jeffries' kidnapping. Also, Department H employed an actual sasquatch as the new team's version of Sasquatch, without telling the team that it was not Walter Langkowski. Department H also arranged the kidnapping of Diamond Lil, another former Alpha Flight member and Madison Jeffries' wife, when she began to enquire about the location of her husband, with the intent of using her as a test subject for illegal medical experiments. The series ended with issue #20 with most of the major storylines (such as the identity of the younger version of Guardian) unresolved, until Wolverine, vol. 2, #140–142, when the plotline was resolved with the return of the real Guardian and the heroic sacrifice of the clone version. In 2004, Marvel started a new volume of Alpha Flight, with the "All-New, All-Different" prefix. Centennial: Rutherford B. Princeton III is a 97-year-old man whose mutant powers of superhuman strength, invulnerability, flight, and heat vision manifested after being awakened from a coma by Sasquatch. The second six-issue story arc, entitled "Waxing Poetic", saw the return of some original team members as both the original versions visited in the past, and temporal copies brought to the present. These members were Guardian, Vindicator, Puck, and Shaman. The Alpha Flight title was relaunched as Omega Flight in April, 2007 as a five-issue mini-series. The new series was written by Michael Avon Oeming and drawn by Scott Kolins. The current roster includes Beta Ray Bill, U.S. Agent, Arachne, Talisman, and Michael Pointer in a suit that looks like Guardian's uniform. Sasquatch appears as the group's recruiter and leader. Since the mini-series the team has ceased to exist losing Beta Ray Bill, U.S. Agent (joining Hank Pym's new Avengers team), Pointer, now calling himself Omega, who has joined Norman Osborn's Dark X-Men, and Julia Carpenter (who has recently become the new Madame Web). 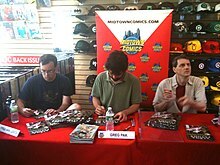 Fred Van Lente, Greg Pak and Mark Paniccia at a signing for Alpha Flight, vol. 4 #1 at Midtown Comics Downtown in Manhattan, June 18, 2011. In the 2010 storyline the Chaos War, the four mainstay Alpha Flight members alive (Snowbird, Aurora, Northstar and Sasquatch) are reunited with Guardian, Vindicator, Shaman and Marrina Smallwood returning from the grave after Amatsu-Mikaboshi's victory in the death realms. The group comes together to fight the Great Beasts until Amatsu-Mikaboshi impales the Great Beasts. The resurrected members of Alpha Flight remain among the living after the defeat of Amatsu-Mikaboshi. At the same time Puck also appears in the "Wolverine Goes to Hell" storyline in Wolverine (2010), beginning in issue #2. In 2011, the team appeared in a series tied to the crossover storyline Fear Itself, with the newly alive team to be joined by Puck. Alpha Flight provides rescue efforts for the victims of a tsunami unleashed by Attuma in the form of Nerkodd: Breaker of Oceans. As Sasquatch, Shaman, and Vindicator help save victims of the water itself, Guardian saves a news crew when their helicopter is shot down by Nerkodd. As Marrina Smallwood and Aurora also arrive to help fight Nerkodd, the female reporter that Guardian saved comments to the television viewers on why Northstar isn't with the team. After providing rescue efforts for victims of the disaster, Guardian ejects Nerkodd from the country by dumping him off the coast of Cape Race. Once Nerkodd is defeated and repelled, Alpha Flight returns to their headquarters, only to end up betrayed by Gary Cody and his newly elected Unity Party. To make things worse, Vindicator has sided with him. It is shown that six weeks ago, Guardian and Vindicator were unable to regain custody of their child Claire. In the present, Marrina is dehydrated, Sasquatch's gamma energy is drained enough for him to revert to his human form of Walter Langkowski, and Aurora and Snowbird are taken down as well. While bringing Guardian to the Box Units for imprisonment, Vindicator is ambushed by Puck. After knocking out Vindicator, Puck tells Guardian that he had just returned to life after his fight with Ba'al. At Parliament Hill, Walter is informed by Agent Jeff Brown that the concussions he had when he played football will cause him to act less human when he changes back into Sasquatch. Jeff also tells Walter that he will soon achieve Unity. Meanwhile, Marrina pretends to give in to the Unity treatment so that she can break free. Shaman manages to knock out Jeff and frees Walter, while Guardian frees Snowbird. Northstar and Puck manage to find Marrina, who has knocked out the guards and scientists present. After Alpha Flight escaped, they learned that Gary Cody and his Unity Party are group of fascists. Northstar abducts a Department H operative and uses aerial torture in order to learn where Department H took Kyle Jinadu. After reclaiming her daughter Claire from her cousin, Vindicator assembles Alpha Strike (consisting of Persuasion, Ranark, a Wendigo, and a brainwashed Citadel) in order to spread the Unity program and take down Alpha Flight. It is soon discovered that Master of the World is behind the Unity Party, the formation of Alpha Strike and what has happened to Department H as he introduces himself to Kyle Jinadu. Alpha Flight ends up robbing a treasury in order to fund a special tactical training from Taskmaster in an isolated Yukon Territory. While overseeing the formation of a revolution against the Unity Party, Guardian, Sasquatch, and Shaman hatch a desperate and dangerous plan that involves the bad personality of Aurora. Aurora's personality begins to cause her to become unstable to herself and Alpha Flight. Meanwhile, Master of the World explains his history involving the Plodex to Claire. Alpha Flight manages to rescue Kyle Jinadu and end up running into Wolverine. While at a beach in Ontario with Claire, Vindicator is visited by Wolverine who states that the people in the United States are starting to be concerned about the Unity Party's actions and him seeing Vindicator call the rest of Alpha Flight traitors causing him to investigate. Wolverine ends up finding Alpha Flight and learns of their revolution against the Unity Party. Wolverine agrees to help them take back Canada just as Alpha Strike attacks. During the ensuing fight, Alpha Flight managed to capture Persuasion as she is a component for a cure that would be used against the Unity Process. Alpha Flight, Wolverine, and Taskmaster are then prepared to take Canada back as Master of the World comes out of hiding. Master of the World begins his attack on Parliament Hill with Agent Jeff Brown and Claire Hudson present in his spaceship. He even manages to kill off Gary Cody upon him is serving his purpose. Guardian continues to fight Vindicator as she orders the rest of Alpha Strike to free Persuasion and destroy the machine she is hooked up to. Alpha Flight managed to defeat Alpha Strike. Vindicator (still under of Master of the World's mental control) helped Alpha Flight against Master of the World when he attempts to kill Claire. Alpha Flight has success creating the machine to free the people that Master of the World had under his mental control. They manage to kill Master of the World, but Vindicator flew off with Claire to an unknown destination. Afterward, Alpha Flight celebrates after the Unity Party is abolished. Alpha Flight later comes to the aid of Red Hulk when the Mayan Gods appear on Earth. Alpha Flight helps Red Hulk fight them with one of the battles putting Aurora, Sasquatch, and Snowbird in a coma, which they recover from. A different version of Alpha Flight debuted as part of the All-New, All-Different Marvel event. This version is a space program that is Earth's line of defense from extraterrestrial threats and resides in the Alpha Flight Low-Orbit Space Station. Its prominent members consist of Captain Marvel, Abigail Brand, Aurora, Puck and Sasquatch. The first wing of the Triskelion is where the ground crew of the Alpha Flight space program resides. The Great Beasts were created by John Byrne and served as antagonists throughout the first 24 issues of his run on Alpha Flight. During the Chaos War storyline, Sasquatch gives Tundra, Kariooq, Ranaq, Somon, Kolomaq, and Tolomaq access to Earth so they can kill Amatusu-Mikaboshi. Neooqtoq is described as the "deadliest" of the Great Beasts. Although the beast itself does not appear, Snowbird assumes its form to battle the slave gods of the Skrulls. After Snowbird freezes them, the Great Beasts are impaled by Mikaboshi's tendrils and presumably killed. Ultimate Alpha Flight debuted in Ultimate X-Men #94 with Vindicator, Shaman, Jubilee, Sunfire, Sasquatch, Snowbird and Aurora. The team ambushes the X-Men in the middle of a friendly baseball game. All of its members appear to use godlike powers; they easily defeat the X-Men and kidnap Northstar. It is later revealed by Wolverine, who apparently has a history with them, that they used a drug called Banshee to enhance their abilities, making them more powerful than normal mutants. Vindicator claims that Alpha Flight is the first internationally sanctioned mutant team made powerful enough to take on any "considerable" threats such as the Liberators, the Brotherhood, and the Ultimates, as Vindicator sees the latter as loyal only to America and Alpha Flight to the world. They are defeated by Colossus's team of X-Men, who were also being powered by Banshee. In issue #11 of Marvel Adventures Iron Man, Tony Stark travels to Nunavut to try to find his father Howard. As he is flying through a series of mountains, he is attacked by Alpha Flight after Northstar and Aurora mistake him for a training robot built by Guardian. After the real drone appears, Sasquatch and Guardian make some hasty apologies before Iron Man continues on his mission. Later in the issue, Alpha Flight aids Iron Man in a battle against the Living Laser. A zombified version of Alpha Flight (consisting of Guardian, Northstar, Aurora, Sasquatch, Puck, and Snowbird) appeared in the first issue of Marvel Zombies: Dead Days, attacking the X-Men at the Xavier Institute for Gifted Youngsters, and killing Professor X in the process. They are later killed by Magneto, who uses his powers to make various metallic objects pierce their brains. In "What If The All-New All-Different X-Men Had Never Existed," Wolverine is shown to be the leader of Alpha Flight when they are loaned to the Japanese government who needed help dealing with Moses Magnum when the Japanese government was unable to reach the Avengers. Both Alpha Flight and the X-Men defeated Moses Magnum. In "What If Wolverine Was Leader Of Alpha Flight? ", the team succeeded in capturing Logan after their fight with the X-Men. In this reality, Logan did not escape from Canadian custody and slip aboard the X-Men's plane. The team chose to turn back around and mount a rescue. The military called Department H to get them to talk the X-Men out of it before the military handled it. Northstar was on monitor duty and chose not to respond. The military then shot the X-Men down- none of them survived the crash. Hudson told Logan face to face with nobody between them, half expecting Logan to kill him. Instead, he told Hudson that since his new family was dead, he had nothing left but to stay with Alpha Flight. He immediately led a mission into the Negative Zone to rescue their Beta and Gamma Flight trainees Puck, Marrina, Smart Alec, Wild Child, Flashback and Box, who had been kidnapped by Annihilus during an experiment by Department H scientists to open doorways to other dimensions. Hudson couldn't lead the rescue mission as Vindicator- he had to stay behind and operate the machinery that controlled the Negative Zone gateway. Wolverine led Shaman, Northstar, Aurora, Sasquatch and Snowbird in, and not only rescued their people, but negotiated peace with Annihilus. He taught Wild Child to control his savagery and got the team to bond better than Hudson ever could, but Northstar was always nervous around Wolverine because of what he did. Hudson knew what would happen if Logan ever learned about Northstar's role in the X-Men's deaths. Their worst fear happened when Professor X and the surviving X-Men (Iceman, Havok, Polaris, Angel) called for help. The Hellfire Club had captured them all and transformed Jean Gray into Dark Phoenix. Alpha Flight rescued them, but Dark Phoenix telepathically showed Wolverine what Northstar did. She tried to get him to kill Northstar, but he killed her instead to free her from the curse of Dark Phoenix. Hudson expected Logan to quit the team, but Logan surprised him by forgiving Northstar and agreeing to stay on as leader of Alpha Flight. In "What if... Wolverine had battled Weapon X? ", the Flight members were in the middle of their training when Guy Desjardins (Weapon X) breaks free after the eponymous program left Desjardins in the hands of Department H.
Alpha Flight appeared in the X-Men episode "Repo Man". It consists of Vindicator (who had renamed himself Guardian in the comics), Puck, Snowbird, Shaman, Northstar, Aurora, Sasquatch, and Dr. Heather Hudson. The episode's story is similar to Guardian's first comics appearance (as Weapon Alpha) in X-Men #109, except that in the comics story Weapon Alpha (the same character as Vindicator) went after Wolverine solo. Vindicator and Alpha Flight capture Wolverine. Department H demanded their project back. Either he rejoins their team or they repossess his indestructible, adamantium skeleton. Puck and Snowbird spied on the attempted adamantium-removal experiment and informed the other members. After a fierce fight between Alpha Flight and Department H's security androids, Wolverine warns the Alpha Flight members that if any of them try to seek him out, all bets are off. Later on in "The Phoenix Saga, Part 5: Child of Light", members of Alpha Flight are shown helping citizens as Earth is ravaged by the M'Kraan Crystal. Department H, the government agency responsible for Alpha Flight is mentioned by name in the Marvel Cinematic Universe television series Agents of S.H.I.E.L.D. in a discussion between Melinda May and Skye/Quake. Alpha Flight's name can be seen in X2: X-Men United on the computer when Mystique hacks into Stryker's computer. In February 2017, while discussing plans for the X-Men film universe following the release Logan and Hugh Jackman's retirement from the titular role, producer Simon Kinberg stated that 20th Century Fox has characters in various stages of development, naming Alpha Flight as one of the teams being prepared for future use along with the Exiles and X-23. An Easter egg reference to Alpha Flight is featured in Deadpool 2 where a taxi cab is advertising a Canadian airline with the same name offering "Cheap Flights, Last Minute Deals, and Travel Insurance" to customers. A direct reference to Alpha Flight was seen in the critically acclaimed X-Men: Legends video game. When the player (as Magma) visits Wolverine's room, the Alpha Flight's insignia is seen. Guardian and Vindicator are given cameos in the sequel X-Men Legends 2: Rise of Apocalypse. Guardian, Wendigo, and Sasquatch appear in Super Hero Squad Online. The Vulcan Dub Squad recorded a song called "Alpha Flight Number 12". The band Courage My Love featured various issues of Alpha Flight in their YouTube video of their song "I Sell Comics". Chicago-based band The Kickback released a song called "Alpha Flight" on their Mea Culpa Mea Culpa EP. ^ ""Captain Marvel" #1 Introduces the New Alpha Flight". Comic Book Resources. 2016-01-20. Retrieved 2016-06-03. ^ "McCann Brings "Alpha Flight" Back From the Omega". Comic Book Resources. Retrieved 2014-07-11. ^ "Cup O' Joe: Marvel T&A: Brevoort's Big Ideas". Comic Book Resources. Retrieved 2014-07-11. ^ Jason Brice. "TAG TEAM REVIEW: Alpha Flight #1 Review – Line of Fire Reviews – Comics Bulletin". Web.archive.org. Archived from the original on July 2, 2011. Retrieved 2016-02-22. ^ "Marvel's Next Big Thing: Alpha Flight". Comic Book Resources. Retrieved 2014-07-11. ^ Avengers Vol. 6 #0. Marvel Comics. ^ Ultimates Vol. 2 #1. Marvel Comics. ^ Captain Marvel Vol. 9 #6. Marvel Comics. ^ What If? Vol. 2 #23. Marvel Comics. ^ What If? Vol. 2 #59. Marvel Comics. ^ "Courage My Love- I Sell Comics". YouTube. 2011-07-08. Retrieved 2014-07-11.